It has good resistance in marine environment and caustic media. When used on stainless steel, it will inhibit interface corrosion. Because its nickel content improved wettability on tungsten carbide tools tips, the largest use is to braze carbide tool assemblies. It is used extensively for carbide tip brazing, but flows less freely. This filler metal does not contain cadmium. Established in the year 1989 at Ahmedabad (Gujarat, India), we “Shree Girraj Trading Corporation” are a Sole Proprietorship firm engaged in Manufacturing an excellent quality range of Silver Brazing Products, Copper Brazing Rods, Brass Brazing Rods, Silver Brazing Flux, Tin Solder Wires, etc. 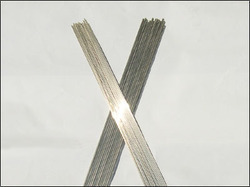 We are also trading a wide range of Welding Electrodes. We sell our manufactured products under the brand name Tech Braze and Suntech. We also trade welding electrodes from reputed brands like Oerlikon and Superon. These products are sourced from reliable market vendors and can be availed by our clients at reasonable prices. Under the guidance of our mentor “Mr. Rahul Agrawal”, who holds profound knowledge and experience in this domain, we have been able to aptly satisfy our clients.